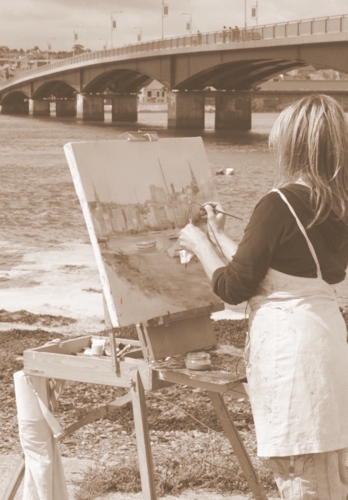 She has been painting since childhood and attended Dun Laoghaire School of Art and Design and has exhibited in Ireland, Europe, and the UK since 1989. Her work has been shown in Ireland, England, Scotland, Amsterdam, Brussels and Berlin, and is collected worldwide, including the Irish State Collection (OPW). She received a double award at the Royal Academy Ulster Academy 2015. Her paintings are the study of character and dynamic found in the human figurative form using oils, or an oil and egg tempera combination as her main medium. Her passion lies with the beautiful techniques of the Old Masters. Using linen or wooden panel as her chosen surface, the process involves carefully building up layers of translucent, semi-opaque oil glazes over an opaque monochromatic under-painting, in either oil or egg tempera, which transcend light and depth of colour, resulting in an illuminating quality to the finished piece that could not be achieved through any other means. This is a classical method of painting that Jackie continuously strives to improve on. Copyright © 2010 Jackie Edwards.